The 26-story apartment towers at 860-880 Lake Shore Drive were the first buildings to be framed and clad in steel. In Mies’s words, “We are not decorating. This is structure. We put up what has to be built and then we accept it.” This is Less Is More with a vengeance. 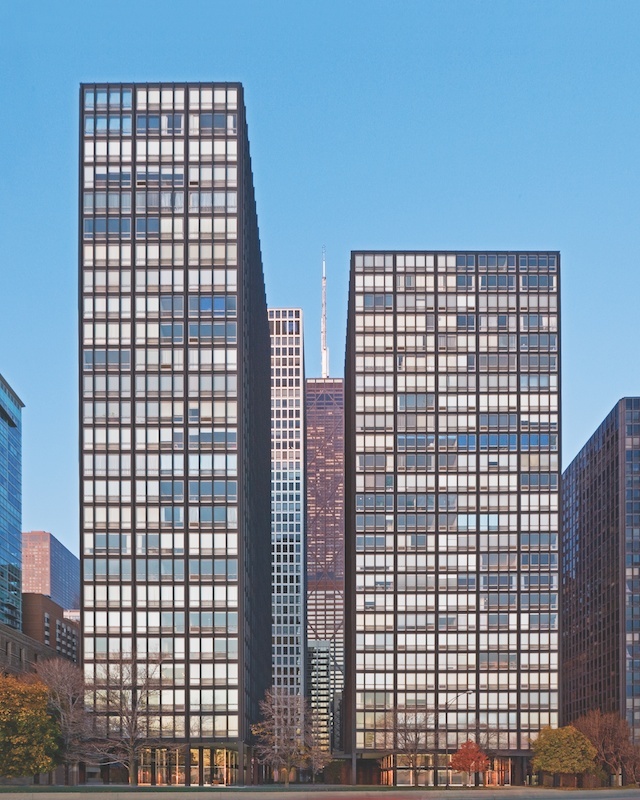 They also are the buildings where Mies either introduced or perfected the features that would define his mature architecture: the glass curtain walls, I-beam struts, recessed lobby and collonade and travertine plaza. Today, these innovations have been so thoroughly incorporated into the modern architectural lexicon that they appear unremarkable. At the time, however, they were radical departures. Many critics consider 860-880 to be the summit of Mies’s oeuvre.